Recently released by Akern Biomedical, the BIAspecialist with more than 30 years of experience in clinical body composition analysis, the novel Bodygram PLUS software is more than just another update of a bio-impedance analysis (BIA) program. Representing a significant methodological advancement, a true mile stone in clinical and research applications of BIA, Bodygram PLUS offers an entirely new concept of body composition analysis in obesity, chronic and severe diseases, and in sarcopenia. Conventional body compartment assessment is enhanced by an innovative analysis of BiaVector powered by artificial intelligence. Bodygram PLUS signifies an intuitive, interactive platform for the analysis of body composition, especially developed for clinical and institutional applications. The program enables a detailed, easy to follow interpretation of nutrition and hydration, particularly in chronic disease and critically ill patients. 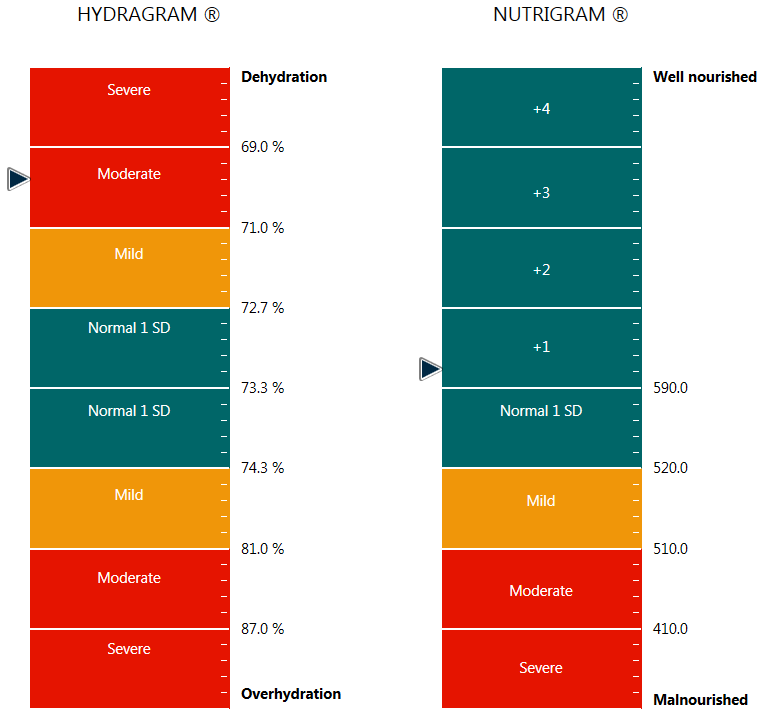 A novel approach to BiaVector analysis powered by the intelligence of an expert system offers a narrative and numerical interpretation of typical clinical conditions, such as fluid overload, dehydration, or malnutrition. Validated parameters allowing a more dependable assessment of sarcopenia have also been implemented. In conventional software programs, BIA evaluations estimate body compartments by assuming hydration of Fat Free Mass FFM at a fixed hydration factor of 73% leading to approximations of FFMand specifically of Fat Mass FM which may under- or overestimate these compartments, notably in the clinically most relevant cases, such as severe obesity, malnutrition, CKD, and heart failure. For the first time in clinical BIA application, Bodygram PLUS implements an expert system based on the analysis of the bivariate Rz/Xc relation, formerly addressed by visually evaluating the BiaVector graph. Now, an innovative, validated determination of individual hydration factors leads to a more reliable approach to compartments, in particular to FM and FFM, when hydration deviates from normal levels. Hydro-correct FM and FFM data are already included in the standard software package. Based on the clinically proven and widely validated BiaVector graph enabling BIA analysis independent of models and assumptions, yet so far incapable of delivering numerical results, Bodygram PLUScontains Hydragram® and Nutrigram® transforming clinical conditions into simple numerical scales. Hydragram® offers an interpretative evaluation of hydration states into normal, mild, moderate, or severe dehydration or over-hydration (fluid overload). Additionally, the individual hydration factor in percent (water content of Fat Free Mass) is given as a numerical reference. Thus, changes in fluid balance can be recognized fast and reliably, assisting therapy follow-up as changes in body water volume are turned into an easy to understand hydration scale. Depicting hydration conditions reliably is of particular clinical value in the assessment of acute illness when BIA is compared to BNP, Pro BNP or GAL as recommended by the European societies in emergency medicine, cardiology, nephrology, sports or nutrition medicine. A novel assessment of nutritional patient conditions, Nutrigram® leverages on the clinical interpretation of BiaVector analysis. Again, the complexity of the Rz/Xc relation is alleviated by categorizing malnutrition into normal, mild, moderate, or severe. Additionally, nutrition is scaled into a well-known clinical indicator, creatinine excretion rate in mg per meter of body height per 24 hours or in mg/kg/24h. Highly related to muscular metabolism and energy expenditure, creatinine clearance entails a strong correlation to bio-electrical properties, the latter itself closely related to bio-active cell mass and its function. Intelligently evaluating this relation by an expert system, Bodygram PLUS links BIA to nutritional evidence. The introduction of a creatinine clearance scale is a significant step to simplifying application of BIA in a wide variety of disease conditions and cachexia. In daily practice, Nutrigram® offers physicians, nurses and nutrition specialists a direct access to clinically meaningful data, in particular when assessing the success of therapeutic interventions. In the development of the Bodygram PLUS software a major focus was placed on providing increasingly important parameters for diagnosing muscle and cell mass loss, especially when following therapeutic interventions. Hydro-correct body mass compartments are given as indices, normalized to body height: FFMI (Fat Free Mass Index), FMI (Fat Mass Index), and BCMI (Body Cell Mass Index). All indices are plotted against percentile norms and represented in trend graphs. For a thorough evaluation of sarcopenia, Skeletal Muscle Mass (SMM) [Jansen], the Skeletal Muscle Mass Index (SMMI), as well as the Appendicular Muscle Mass Index (ASMMI) are derived and represented against normative data. Reflecting the paramount clinical importance of phase angle in the more current scientific literature, a Z-score of phase angle is introduced and compared to norms. Optional entry of hand grip strength data offers a complete assessment and documentation of patient condition. Body compartments are given numerically but more so in bar charts with colored normative ranges, allowing an immediate visual judgement of results. For all age ranges, test results can be compared to norms in relation to both body weight and height. As body weight is a co-predictor, normative data based on body height is imperative in properly evaluating obese and underweight subjects. Also for pediatric populations norms scaled in percentiles are available. For a variety of purposes, a choice of different reports can be printed, stored, or transferred in PDFformat, including narrative explanations for patients or clients. A calendar function facilitates test planning. Test data are automatically stored in a proprietary data base, enhanced by simple search functions, able to hold and retrieve thousands of patient tests. The Bodygram PLUS program package optionally includes a special module assisting clinicians, trainers, and nutritionists in weight management. Based on a given PAL (Physical Activity Level) and selected activities, a forecasted weight reduction is compared to actual weight loss. This simple yet impressive documentation defines a clear, achievable, and finally motivating goal, but also makes deviations immediately obvious. This valuable feedback enables trainers and nutritionists to interfere earlier and more effective. Bodygram PLUS will offer you direct access to a profound knowledge base in body composition analysis. Yet clinical interpretation of individual results is certainly facilitated by a general understanding of body composition methodology. Therefore participation in our frequently held live web-seminars is recommended. In a compact format, our specialists disseminate the knowhow to safe BIA application, achievement of reproducible results, and thorough interpretation. The seminar focusses on proven concepts of BIA analysis in nutrition counseling, weight management, training guidance, therapy control and follow-up in nutritional medicine, oncology, nephrology, and other medical disciplines. More than 90% of previous participants rated the seminar as ‘good’ or ‘very good’.